Vegetarian Zucchini Lasagna is creamy, cheesy and flavorful. Vegetarian Zucchini Lasagna is easy to make. Vegetarian Zucchini Lasagna made with layers of roasted zucchini and onion, a homemade marinara sauce and plenty mix of paneer/cottage, mozzarella and parmesan cheese! Vegetarian Zucchini Lasagna is perfect for weekend lunch or dinner. Vegetarian Zucchini Lasagna is the ultimate comfort food. Zucchini, that versatile veggie, takes center stage in our delicious vegetarian lasagna with paneer/cottage cheese. You’ll love the fresh flavors in this twist on a classic Italian dish. The very best vegetarian lasagna.…that just happened. And I’m just putting this out there; this is quite possibly the best thing I’ve eaten in a long time. No joke! The very best vegetable lasagna. Kick up your veggie intake with this warm and bubbly vegetarian Zucchini Lasagna. This premium vegetarian recipe is tasty, cheesy and sure to please vegetarians and omnivores alike. Grab a fork and dig in. It is a great make-ahead dish to prep on a weekend and eat during the week. Enjoy a hearty meatless feast. A lighter spin on a classic comfort food, this Vegetarian Zucchini Lasagna is filling & packed with vegetables and scrambled paneer/cottage tastes just like the real stuff! 1. Preheat the oven on 350f/180c. 2. Wash the zucchini, cut it into thin slices and keep aside. 3. Heat oil in a skillet pan; add minced garlic, onion and sauté it until onion become soft golden brown. 4. Add zucchini slices, salt, pepper, ground black pepper, Italian seasoning, red pepper flakes and stir fry it for 2 minutes on medium flame, then switch of the flame and keep aside. 5. In a big sauce pan boil the water and cook the lasagna sheet as per the packet direction, drain it and then lay flat on a sheet of aluminum foil. 6. Take one mixing bowl; add scrambled paneer/cottage cheese, parmesan, mozzarella cheese and keep aside. 7. Now take the square baking pan/Lasagna pan, spray some oil then spread 2-3 tbsp full spoon of marinara sauce. 8. 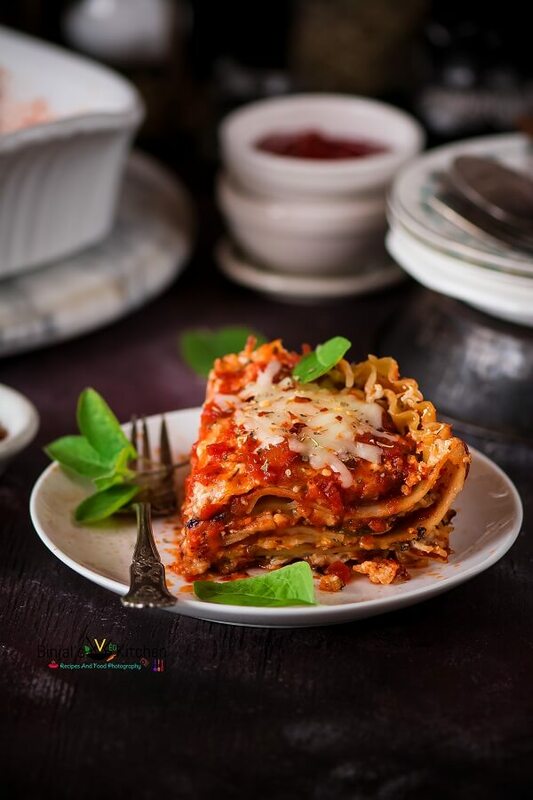 Then arrange the boiled 3 lasagna noodles/sheets over the sauce for the first layer, then spread 1/3 part of cooked zucchini mixture on it, spread about ¼ cup of marinara sauce, then spread 1/3 part of cheese and paneer mixture over it. 9. The first layer is done now, again repeat the same process and make more 2-3 layers. Once done arrange some fresh basil leaves on the top. 10. Cover the prepared baking sheet/pan using aluminum foil, place it into the preheated oven and bake it about 20 mins with cover, then remove the cover and bake it again uncovered about 10 mins to until cheese is crusty around the edges. To make the cheese golden brown on top, slide under the broiler for 1 to 2 minutes. 11. Vegetarian Zucchini Lasagna is ready, let it be cool down little bit, then serve it fresh and enjoy. • You can add more veggies along with zucchini, like eggplant, spinach, mushroom etc. • If making ahead, you can cover it and refrigerate it unbaked up to 2 days. • Baked lasagna can freeze as well. Let it cool completely on a rack before freezing, and then wrap it well with foil. Preheat the oven on 350f/180c. Wash the zucchini, cut it into thin slices and keep aside. Heat oil in a skillet pan; add minced garlic, onion and sauté it until onion become soft golden brown. Add zucchini slices, salt, pepper, ground black pepper, Italian seasoning, red pepper flakes and stir fry it for 2 minutes on medium flame, then switch of the flame and keep aside. In a big sauce pan boil the water and cook the lasagna sheet as per the packet direction, drain it and then lay flat on a sheet of aluminum foil. Take one mixing bowl; add scrambled paneer/cottage cheese, parmesan, mozzarella cheese and keep aside. Now take the square baking pan/Lasagna pan, spray some oil then spread 2-3 tbsp full spoon of marinara sauce. Then arrange the boiled 3 lasagna noodles/sheets over the sauce for the first layer, then spread ⅓ part of cooked zucchini mixture on it, spread about ¼ cup of marinara sauce, then spread ⅓ part of cheese and paneer mixture over it. The first layer is done now, again repeat the same process and make more 2-3 layers. Once done arrange some fresh basil leaves on the top. Cover the prepared baking sheet/pan using aluminum foil, place it into the preheated oven and bake it about 20 mins with cover, then remove the cover and bake it again uncovered about 10 mins to until cheese is crusty around the edges. To make the cheese golden brown on top, slide under the broiler for 1 to 2 minutes. Vegetarian Zucchini Lasagna is ready, let it be cool down little bit, then serve it fresh and enjoy.